McLaren Automotive is a marque that has been in the making for decades. More than 20 years passed between the launch of McLaren Racing in 1966 and the creation of McLaren Automotive and the F1 in 1989, and then another 20 years before the production branch created the 12C, their second production car. Since 2009, they’ve launched an impressive quantity of production cars, each of which has proven to be fantastic on the road and track. The 650S, a supercar capable of being a daily driver, was the centerpiece of their presence at the 2014 Geneva Motor Show. Now, to look back at the races that first confirmed McLaren’s engineering prowess, they’re releasing a limited edition version of the popular car: the 650S Can-Am. “Can-Am was big, bad, brutal; the cars were magnificent. Lightweight, overpowered, oversteering, really really quick and everybody loved it,” describes Alastair Caldwell, McLaren Racing teammate since 1967, in a YouTube video shared today. There were few regulations for these races, and even fewer restrictions, but as Caldwell describes, McLaren’s cars were developed with two goals: to be the best looking and to be the most reliable. In the Spring of 2016, it will be the 50th anniversary of the inaugural Can-Am races, and in honor of that fact, only 50 of these 650 Can-Am models will be created. A press release issued today shares that they’re available in three colors, Mars Red, Papaya Spark and Onyx Black, all with a racing livery that pays tribute to the McLarens used in those races. Power from the 3.8-liter twin turbo V8 is set at 641 bhp and 500 lb-ft, with a 0-62 mph time of 3 seconds flat and a top speed of 204 mph. The sound of that engine is channeled through a carbon fiber rear grille and four circular tailpipes, creating an echo effect that increases aggressive character. 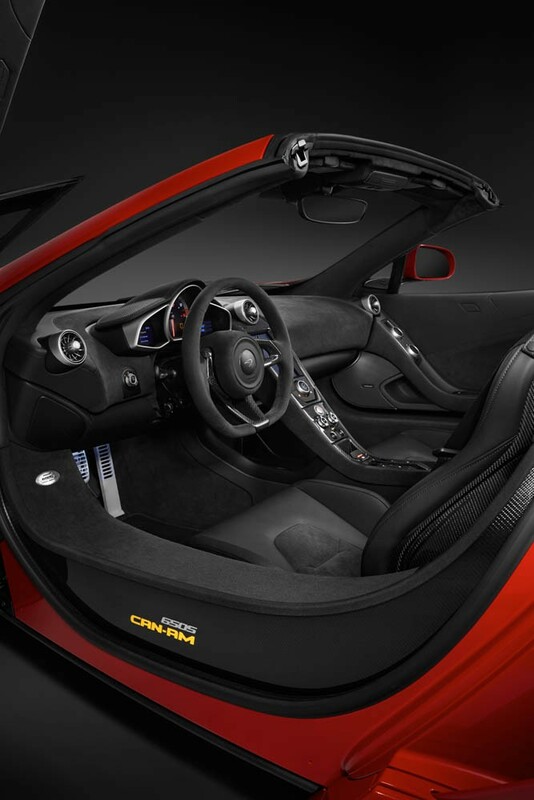 In fact, carbon fiber is found throughout, particularly in one feature that’s new for the 650S. These Can-Am models all feature an automatic, fully-retractable, carbon fiber hard top, marking the first time such a top has been used by the marque. This special edition McLaren is available for order now, with a price of £255,850, or, as a representative at McLaren’s public relations firm informs us, $392,000 USD for American customers. Deliveries will begin in the spring of next year. Visit McLaren’s website to learn how you can place an order for a 650S Can-Am, or find a 650S that you don’t have to wait for from our exclusive listings at the button below. Editor’s Note: The correct U.S. pricing has been added to the article. An earlier version of this article listed the price as $392,000 USD, which was the value of the direct exchange rate for British pricing.